One of the heads of the Columbus Songwriters’ Association recently had high praise to give Blinded Again, saying it was both an incredibly solid album as well as “relevant.” I’m here to offer my agreement and endorsement of this young folk band with some bluegrass and gospel tendencies. The band’s namesake, Daniel Dye, sings with a slight swagger that is reminiscent of a Matt Berninger gone country character. Yes, I just implied that the lead singer of The National could succeed in a country band. Thankfully, Blinded Again avoids the cheesy mainstream country that Tim McGraw, Rascal Flatts, and Keith Urban have brought to the masses. What we have here is thoroughly organic and full of soul. The title track, with its catchy, traditional sounding melody unashamedly proclaims the singer’s imperfections as he repeats a plea for salvation in the chorus. 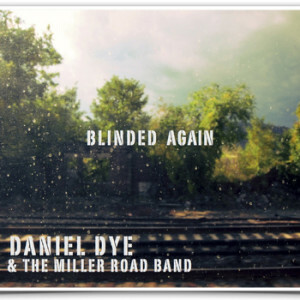 The soft banjo and female harmonies from Daniel’s sister Sarah Kelly really drive home the sound, making “Blinded Again” a good tune for using as an introduction to the band. While most of the time Dye’s voice takes the forefront, don’t be deceived. This project is definitely a BAND. Not a person with some nice sounding background noise. “Hard Cider” exemplifies the “band” aspect of the music the best of any track on the record. I knew that just from the first ten seconds of the song where the violin roars in (a weird way to describe it maybe) assertively. The accordion and violin overlaying one another with some rather tasty acoustic guitar work exemplify the band’s prowess as well in “Those Devils,” which is solid song all around – not just good for the technical work behind the instrument playing. The song ends in a climax that’s unlike anything I’ve heard in folk music thus far. Ultimately, the band has the chops to stand against some of their much larger counterparts in the industry. Along the way though, the band will proceed in humility and make sure you know exactly Whom they are leaning on for support and sustainment. Daniel Dye and the Miller Road band is on Facebook. Buy their album on bandcamp.